I first had this dessert at a 4th of July gathering. It was perfect just for the color which blended in to the color scheme of the day! Any type of mochi is always a favorite local dessert, but with blueberries added in! Preheat oven to 350 degrees. Lightly grease a 9x13 inch baking pan In a mixing bowl; stir sugar in melted butter. Add milk, eggs and vanilla; mix well. Stir in baking powder and mochiko. Gently fold in the blueberry pie filling creating a marbleized look. Bake 1 hour. Allow to cool completely before slicing. 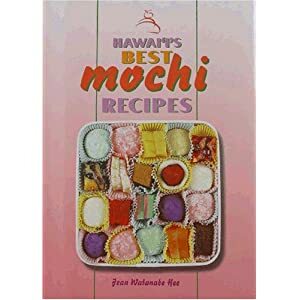 Cut the mochi with a plastic knife or it will stick.